As young kids we had library cards just as soon as we could sign our names. As the town we grew up in expanded, so did the library, and we were there constantly, taking books back and forth. We had one small tv and 8 people living in the house, plenty of opportunity to spend time doing other things. In elementary school I shared a room with my younger brother. In a 5 bedroom house someone had to move out before I had a room of my own. My bed was by the window, and I read by the light of the streetlight at night, we had an early bedtime and many nights I was not sleepy. After our father died, we moved and ended up at one of the largest high schools in the area. My graduating class was about 1,100 people. The school had well over 3,000 students. People got lost going to class. The library was good sized, and in three years there I read my way pretty much through the entire thing. My brother told me that every book he ever checked out had my name in it: pre digital scan of a bar code there was a system of cards and names and book pockets. He read younger and earlier than I did, which means he was right on my heels in what we were reading. In elementary school my older sister put me in a book of the month club, starting with the "I Can Read" series...and then on to chapter books. Thrilling every time a package arrived. In adult life I had the pleasure of working for a couple of different book publishers. Amazing access to a staggering number of books and I did my best to keep up. Magazines too. As farmers, it is surprising how many magazines are relevant to what we do. Our local library branch has a smaller collection of books than my high school did: makes sense, as we live in a rural community and not the densely populated area I grew up in. Now I am increasingly interested in reducing my consumption. In reducing the stuff, the goods in my possession. Having a perspective that what we do has a profound effect elsewhere. My reading devices, whatever form they take, use up resources. I'm working on reducing this stack, this pile that has always been a part of my life. A trade journal (yup, even farmers have them) is available in an on line only version. 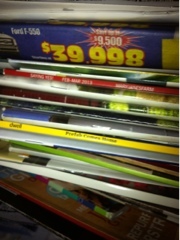 Several of the monthly magazines are too. The iPad makes it easier to hold onto the information, to search by topic, to read about emerging information. I'm not giving up information but I am moving to a new format, and whenever possible using the online version. It's time for subscription renewals and there is only one that will be here in print form...the information is valuable, and there just is no other option. But the rest will be here in digital form or not at all. My parents, rumor has it, met in a bookstore. In the thriving metropolis of Danville, IL. That bookstore has been closed for decades. My parents held books sacred, and I can still hear my fathers words coming out of my mouth "don't treat a book like that, you will break the spine". Sorry folks. I'll keep reading. Just in a different form.